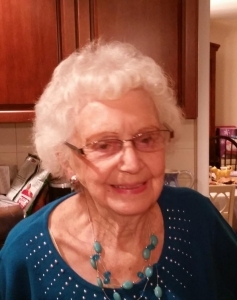 Margaret (Peg) Ahrendt, 98, formerly of Twin Oaks passed away on January 19, 2019. She was born in England and raised in Trenton, NJ. She moved to Twin Oaks, Upper Chichester, PA in 1961, where she resided for 55 years before moving to Virginia Beach. She was a homemaker and later employed at the Franklin Mint for 20 years. Peg was a lifetime member of the U.C.S.C. Club and enjoyed traveling, especially to casinos. She was predeceased by her husband, Bob, her sons, Robert and Richard, and many dear friends and neighbors. Left to cherish her memory are her daughter, Linda White (Dan), and her daughter-in-law, Irene Ahrendt; grandchildren, William White (Kass), Denise Yannick (Joe), Tracey Ahrendt, and Kristy Ryner (Rich); great-grandchildren, Rya Ahrendt, and Joey, Dylan, and Lucas Yannick. Her funeral service will be held on Friday, January 25th at 1:30pm at the Joseph A. Ward Funeral home 1459 Market St. Linwood, PA. Friends and family are invited to call from 12:30-1:30 at the funeral home. Burial will follow in Lawn Croft Cemetery.